We are all capable of experiencing wisdom in our lives. 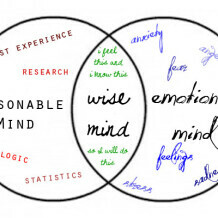 Wise Mind is a core dialectical behavior therapy concept. DBT was developed by Marsha Linehan and teaches mindfulness-based skills that can enhance a person’s sense of well-being. Wise mind is the integration of Reasonable Mind and Emotional Mind. Reasonable Mind helps us learn new skills, define a problem objectively and apply the skills toward problem-solving and rational understanding. For example, if we wish to regulate our emotions, we must be able to name the emotions that we are experiencing, understand events and interpretations that prompt certain emotions (triggers), what our emotions compel us to do, and what the aftereffects or outcome will be. Emotional Mind occurs when we let our emotions control our thoughts and behavior. You act the way you feel, with little sensitivity to context or discretion and no thought to what kind of outcome you are creating. You will notice when you are using your Wise Mind when you absolutely know you have done the right thing, without any feelings of anxiety, regret or dread. Wise mind is sometimes experienced in the center of the body, the center of the head, or between the eyes. Sometimes a person can find it by following the breath in and out.